Many tech startup founders pitch their project by saying ‘It’s just like Instagram, but with [filling in their differentiator],’ or, ‘Imagine Pinterest, but only [filling in their differentiator]’. Quite peculiar, most of them are located in places like Silicon Alley, Silicon Hill or Silicon Forest. With ‘startup’ being the thing to do for many (particularly right out of college) this hot minute, it is the idea of starting something (anything really) that is often greater than the business idea in itself. Innovations turned into variations of the same, leaving the invention behind, while startup meccas themselves turned to cloned names: Silicon Alley (New York), Silicon Beach (Los Angeles’ West Side – Note: we pushed for the name Tech Coast), Silicon Roundabout (London), Silicon Forest (Portland), Silicon Hill (Washington D.C.) not to be mistaken with Silicon Hills (Austin), Silicon Border (Mexicali), Silicon Sloboda (Moscow) and many more. Silicon Valley was named after the prosperous semiconductor manufacturers that were inhabiting the surrounding San Francisco area in the 1970’s. Today, as too many Silicon Valley clones are churning out too many Snapchat clones, it is time to remind ourselves what Silicon Valley was named after: An element; and there are no two elements that are alike. 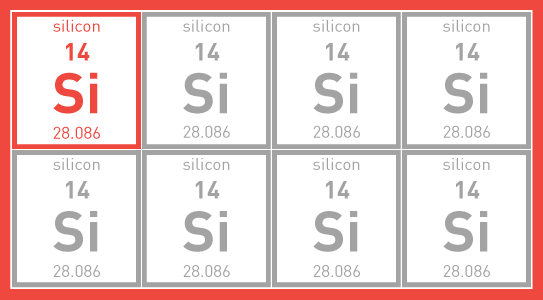 Silicon as an element only exists once. The periodic table is yours to experiment with. Time to get creative. I can’t wait to hear about, better yet, be part of that journey. Great observation. I think the “shorthand” for startups has also contributed to very formulaic approaches to brand building. I’ve been thinking about this for a while but hadn’t articulated it so well!